This pair of Vases is very scarce simply because it is a matching pair. 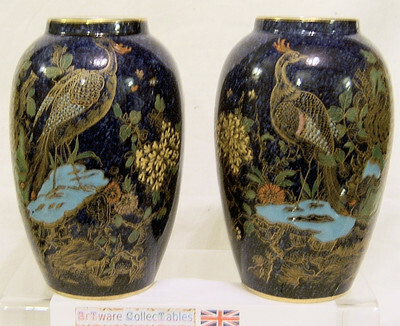 Set on a dark blue lustre ground, there is the usual design in the Rockery & Pheasant decoration but on the one Vase, the bird is facing right whereas on the other Vase it is facing left. There is much gilded foliage with the occasional enamelled butterfly outlined in gilt and the Pheasant is standing on a turquoise base, possibly to suggest water. It has the pattern number 2041. 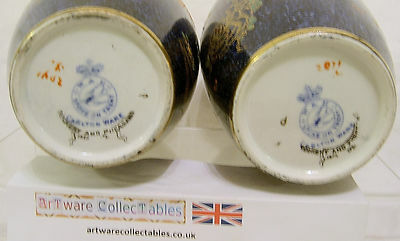 Manufactured by W & R Carlton Ware in the 1920s each is in excellent condition. The gilding around the rims and base has just a little rubbing. Each Vase stands 5.75 inches (14.5 cms) tall.